Just outside the resort town of Peschiera del Garda on the shores of Lake Garda, the 19th-century English-style Parco Giardino Sigurtà, or Sigurtà Park, is considered among the most beautiful gardens in Europe, with a Great Lawn, large hedgerow maze, Avenue of the Roses, and Water Gardens. Originally the private grounds of the 17th-century Villa Maffei, the garden was created in the early 19th century by the Marquis Maffei, though fell into a state of abandon when the family line ended a century later. 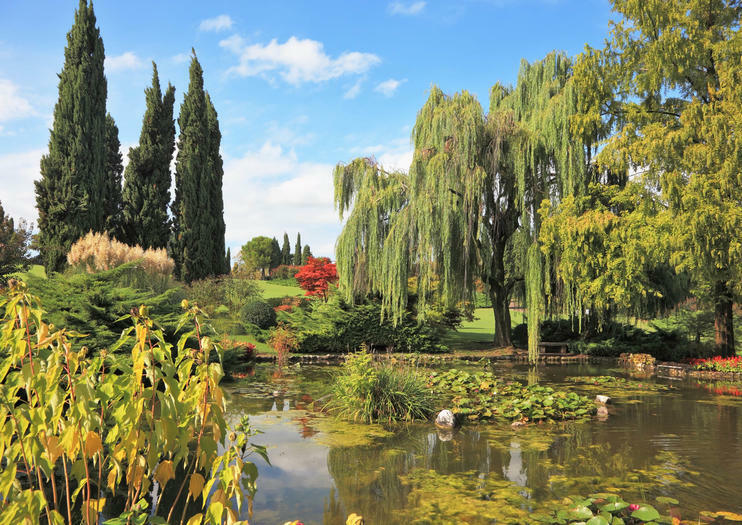 The estate was purchased by the Sigurtà family in 1941, who restored the garden to its original glory and expanded it from its original 54 acres (22 hectares) to its current 148 acres (60 hectares). Sigurtà Park is one of the most popular in Italy, so booking tickets ahead is recommended to avoid the line to enter. The park includes a small area with farm animals that visitors are welcome to pet, especially fun for younger kids. Visitors can explore on foot by following the free map or app provided at the park entrance, by rental bike or e-bike, by rental GPS-guided golf cart, or aboard the park train or shuttle. The park is entirely accessible to visitors with disabilities, including the park train. There are a number of snack bars, a gelato stand, and a pizza-by-the-slice shop inside the park. Sigurtà Park is just outside the pretty medieval village of Valeggio sul Mincio. From the A4 highway, take the Peschiera del Garda exit and then follow the signs to Valeggio sul Mincio. From the Peschiera del Garda train station, take APAM bus 46 or ATV bus 479. The best time to come is during Tulip Mania, a few weeks in early spring when the park’s million tulips bloom in profusion. The park is closed from November to March each year. Depending upon the month you visit, you can expect to see the park’s famous tulips along with irises, dahlias, roses, lilies, hydrangeas, hibiscus flowers, and a number of aquatic plants like water lilies and lotus flowers. We meet in Villafranca di Verona to collect electric bikes. The tour begins with a ride around the Scaligero Castle and then continues towards Valeggio sul Mincio along the new Risorgive cycle path. We will be along the river surrounded by verdant sceneries of the typical Italian countryside so to relax and enjoy nature. It is easy to see many wild animals such as hares, foxes and pheasants both early in the morning and late in the afternoon. The destination of our journey is the medieval village of Borghetto, awarded the title of one of the most picturesque villages in Italy, where you will have time for a coffee break and take great landscape photographs with your smartphone. We slowly return to Villafranca taking another road through vineyards and old farms. Finally we leave the electric bikes in Villafranca and, why not, we could go and eat in a traditional pizzeria. Easy recipes, excellent wine and simple choices, unique moments that define the essence of an Italian lifestyle through cooking.... more than a cooking class, "Pastiamo Design Kitchen" is a pleasant experience: we cook fresh pasta and gnocchi together, we chat, eat and taste excellent wines.Two main courses and a dessert.Apron and final certificate included.- English speaking.